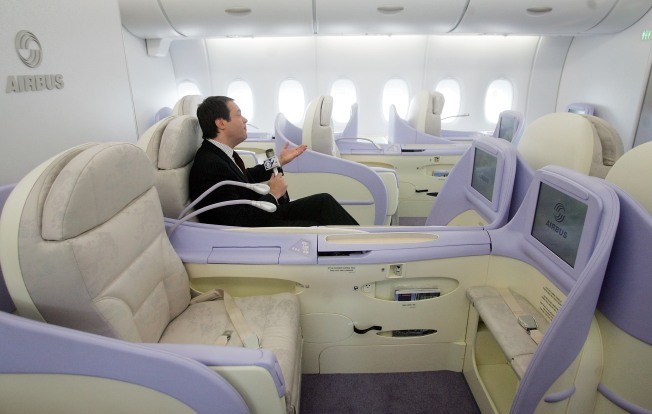 A reporter sits in a first-class seat of the new double-decker Lufthansa Airbus A380 after it arrived at JFK International Airport following its first route-proving flight to the United States with over 500 passengers March 19, 2007 in New York City. Ask anyone who flew before 1978 about the golden age of air travel, and they probably won’t hesitate to tell you about the glories of pre-deregulation flying. But some passengers and industry observers beg to differ. They say that now is the golden age. “Flying is cheap, astonishingly safe, and there are planes going virtually everywhere, all the time,” said Patrick Smith, one of the leading voices countering the conventional wisdom that air travel was better before 1978. Smith has been arguing his case for the better part of a decade, in a regular column on Salon.com, but he acknowledges that it’s been a struggle. “People have it cemented in their minds that flying is a tedious and expensive experience,” he said. They also believe the Airline Deregulation Act of 1978, which removed significant government controls from the U.S. airline industry, is essentially to blame for bringing the golden age to a screeching halt. But is the golden age past or present? The question came to the forefront recently, when an icon of pre-deregulation air travel, the first Boeing 747 to ferry commercial passengers, was unceremoniously sent to a South Korean junkyard. The Trippe, which was named after Pan Am’s founder Juan Trippe, was scrapped after being used as an aviation-themed restaurant. “Nostalgia always tints our memories with a golden hue,” said Henry Harteveldt, an airline analyst at Forrester Research. Harteveldt, who can remember flying pre-deregulation, says he sees both sides of the debate. Flying was more civilized, even for passengers seated in coach, which had 34 inches of seat pitch back then (pitch is an industry term for the distance between seats). Today’s economy class seats offer 32 inches — and often far less. Vote: What do you consider the Golden Age? Harteveldt stops short of calling today the golden age. But for some passengers, there’s no question: The good old days are long gone. True, fees and surcharges are up dramatically, and in some markets, so are airfares. Hilary Stockton, an editor for the website TravelSort, recently quantified the losses and gains in an infographic on her site. When adjusted for inflation, airfares are significantly lower — but it’s also undeniable that service and amenities have slipped since deregulation, the chart shows. Indeed, industry-watchers like Seth Kaplan, a managing partner for the trade publication Airline Weekly, say these are the best days for one simple reason: Almost anyone can travel by air. “The cheapest plane tickets are about as cheap as ever, meaning hundreds of millions of people around the world get to fly each year who literally wouldn’t be able to if not for — especially — low-cost carriers and others who have to compete with them,” he said. Which isn’t to say the amenities have vanished. They are available, for a price. “People with more means can experience levels of luxury that no one could have imagined before 1978, [such as] showers and private sleeper suites aboard an Emirates A380,” he added. He says commercial air travel today is a shadow of its former self. “Today, flying is faster but far less personal. We are seat occupants, and airlines — while trying to not make their line seem unfriendly — care about saving fuel, cutting every corner and making profits through additional fees such as those generated when checking baggage,” he said. One thing is certain: Flying in 2010 is far different than it was in 1978. Or 1948. Some amenities were unimaginable a few decades ago. Take in-flight Internet connections, for example. Eric Sedransk, an entrepreneur who runs a website for golfers called TheEarlyBirdie.com, wouldn’t turn the clock back by more than three decades because he’d lose his onboard connection. Other advances include live television in every seatback, even in economy class. And one other important one. With or without deregulation, the airline industry would have evolved. And people would have changed. Passengers and industry-watchers might still have the Golden Age debate, but they’d just be asking a different set of questions. In the end, say observers, it is probably pointless to wonder if the airline industry’s best days are behind it. It is particularly meaningless to yearn for a time when air carriers competed based on service, not price. Times change, says Harlan Platt, a finance professor at Northeastern University. It's inevitable.